Dodgers first basemen Adrián González and pitcher Alex Wood along with local dignitaries dedicated the two fields on Saturday with a baseball clinic and a Dodger Day festival. Gonzáles and his wife, Betsy, contributed in the renovation and donated to the Dodgers RBI youth development program. The donation covered uniforms, equipment, and the registration fees for all participants. 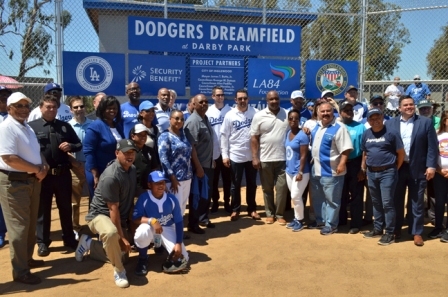 The LA84 Foundation, the Ahmanson Foundation, and City of Inglewood Department of Parks, Recreation and Library Services partnered with González and his wife to make the Dreamfields possible. This marks the 46th and 47th Dodgers Dreamfield, the Dodgers Foundation is only three away from their goal of 50. So far, the foundation has invested $7.7 million in refurbishing baseball fields with the hope they will inspire inner-city youth to value and participate in America’s favorite pastime.